The coke oven by-product plant is an integral part of the by-product coke making process. During the production of coke by coal carburization in a coke oven battery a large amount gas is generated due to the vaporization of volatile matter in the coal. The gas is generated over most of the coking period, the composition and the rate of evolution changing during this period and being normally complete by the time coal charge temperature reaches 700 deg C. This gas is known as raw coke oven gas and is processed in the by-product plant. The functions of the by-product plant are to process the raw gas to recover valuable coal chemicals and to condition the gas so that it can be used as a clean, environmentally friendly fuel gas. After leaving the coke oven chambers, the raw coke oven gas is sprayed with flushing liquor so as to reduce its temperature to a reasonably low level and to condense the most easily condensable (high boiling point) components. The raw gas is cooled by adiabatic evaporation of some of the spray liquor to around 80 deg C and is water saturated. The temperature of the gas becomes sufficiently low so that it can be handled in the gas collecting mains. From the gas collecting main the raw coke oven gas flows into the suction main. The amount of flushing liquor sprayed into the hot gas leaving the oven chambers is far more than is required for cooling, and the remaining flushing liquor which is not evaporated provides a liquid stream in the gas collecting main. At this stage there are two streams namely a liquid condensate stream and a gas stream. The two streams pass through a butterfly control valve before leaving the coke oven battery area. This control valve is set to maintain a slightly positive pressure in the collecting main to provide safe working conditions in the coke oven chambers. The liquid stream in the gas collecting main flushes away condensed tar and other compounds. The stream of flushing liquor flows under gravity into the suction main along with the raw coke oven gas. The raw coke oven gas and the flushing liquor are separated using a drain pot (the down comer) in the suction main. The flushing liquor and the raw coke oven gas then flow separately to the by-product plant for treatment. In order to make raw coke oven gas suitable for use as a clean, environmentally friendly fuel gas, the by-product plant must carry out the following functions. To remove hydrogen sulfide to meet local emissions regulations governing the combustion of coke oven gas. In addition to treating the coke oven gas, the by-product plant must also condition the flushing liquor that is returned to the coke oven battery, and treat the waste water that is generated by the coke making process. 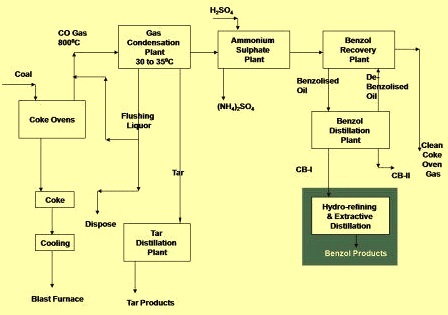 Typical block diagram of byproduct plant is shown in Fig 1. The tar and liquor plant process the flushing liquor that circulates between the by-product plant and the coke oven battery. It also processes the waste water that is generated by the coke making process and which results from coal moisture and chemically bound water in the coal. The main functions of this plant are as follows. Continuous rapid separation of a suitable flushing liquor stream. This is a very important function since this flow is needed to cool the hot oven exit gases down to a temperature which can be handled in the gas collecting system. Separation of a clean and tar free excess ammonia liquor for further processing. Separation of a clean tar essentially free from water and solids. Since the flushing liquor supply is very important, stand by equipment are normally provided for flushing liquor decanting and recirculation. The flushing liquor flows into tar decanters where the tar separates out from the water and is pumped to tar storage for processing in tar distillation plant or for sale. Heavier solid particles separate out from the tar layer and these are removed as tar decanter sludge. The aqueous liquor is then pumped back to the battery, with a portion bled off from the circuit which is the coke plant ‘excess liquor’ or waste water. This contains ammonia and, after the further removal of tar particles, it is steam stripped in a still. An alkali such as sodium hydroxide is added in the still to decompose ammonia compounds dissolved in the liquor. The ammonia vapor from the still is then either fed into the coke oven gas upstream of the ammonia removal system, or the still itself is often integrated into the ammonia removal system. Either way, the ultimate fate of the ammonia removed from both the coke oven gas and the waste water is the same. The stripped still effluent is either discharged or is treated in an on-site biological effluent treatment plant to remove residual ammonia, phenol and cyanides. The gas treatment processes in the by-product plant usually consist of the following plant equipments. Primary gas cooler – Primary gas cooler cools the raw coke oven gas to remove water vapour so as to reduce its volume. Primary cooler are two basic types, the spray type cooler and the horizontal tube type. In a spray type cooler the coke oven gas is cooled by direct contact with a recirculated water spray, with the contact cooling water being itself cooled externally in heat exchangers. In the tubular type, the coke oven gas is cooled indirectly by flowing across horizontally mounted tubes through which cooling water is pumped. In this case, the cooling water does not come into contact with the coke oven gas and so it can be cooled in a cooling tower for example. As the coke oven gas is cooled, water, tar and naphthalene condense out. The condensate collects in the primary cooler system and is discharged to the tar and liquor processing plant. Tar precipitators – As the raw coke oven gas is cooled, tar vapour condenses and forms aerosols which are carried along with the gas flow. These tar particles contaminate and foul downstream processes and foul gas lines and burner nozzles if allowed to continue in the gas stream. The tar precipitators typically use high voltage electrodes to charge the tar particles and then collect them from the gas by means of electrostatic attraction. The tar precipitators can be installed before, or after the exhauster. Exhauster – The exhauster provides the motive force to induce the coke oven gas to flow from the coke oven battery and through the by-product plant. The exhauster is of prime importance to the operation of the coke oven battery. It allows the close control of the gas pressure in the collecting main, which in turn affects the degree of emissions in the coke oven battery like door emissions. A failure of the exhauster will immediately result in venting to atmosphere all the generated the raw coke oven gas through the battery flares. Ammonia removal – Due to the corrosive nature of ammonia, its removal is very much necessary in by-product plants. The removal of ammonia from coke oven gas results into yield of ammonium sulfate, a saleable product. The ammonium sulphate process is basically involves contacting the coke oven gas with a solution of sulphuric acid. The different variations include the use of an absorber, in which the sulphuric acid solution is sprayed into the gas, or the use of a saturator in which the gas is bubbled through a bath of sulphuric acid solution. The sulphuric acid reacts readily with the ammonia in the coke oven gas to form ammonium sulphate. This is then crystallized out, removed from the solution and dried and sold as a fertilizer. More modern processes for ammonia removal include the water wash process in which the coke oven gas is scrubbed by water, which dissolves the ammonia, along with some hydrogen sulfide and hydrogen cyanide. The resulting scrubbing solution is pumped to ammonia still where steam is used to strip out the ammonia. The ammonia vapors from the still can be processed to form ammonium sulphate similar to the processes described above, condensed to form a strong ammonia solution, incinerated or catalytically converted to nitrogen and hydrogen which are then recycled back into the coke oven gas. Another process for ammonia removal from coke oven gas is the PHOSAM process developed by US Steel. This process absorbs the ammonia from the coke oven gas using a solution of mono ammonium phosphate. The process produces saleable anhydrous ammonia. Final gas cooler – Final gas cooler removes the heat of compression from the coke oven gas which it gains while flowing through the exhauster. This is necessary since the efficiencies of many of the by-product plant processes greatly improve at lower temperature. The final gas cooler is therefore placed upstream of water wash ammonia scrubbers. Final gas coolers typically cool the coke oven gas by direct contact with a cooling medium, either water or wash oil. An important aspect of final gas cooler operation is that when the coke oven gas is cooled below the outlet temperature of the primary gas cooler, naphthalene will condense from the gas. This naphthalene readily crystallizes out from the cooling medium and will foul equipment if not disposed off. In wash oil final gas coolers, the naphthalene dissolves in the wash oil and a side stream of oil is steam stripped to remove the naphthalene. If water is used to cool the coke oven gas, the condensed naphthalene is absorbed using tar. The tar is either entrained in the cooling water, with a portion of the flow being continuously blown down for treatment, or it takes the form of a tar layer through which the cooling water flows. The tar is continuously exchanged with fresh tar from the tar and liquor processing plant to dispose of the absorbed naphthalene. Naphthalene removal – Naphthalene is removed from coke oven gas in a gas scrubbing vessel using wash oil. The vessel can be of packed type or it can be of the ‘void’ type in which the wash oil is sprayed into the gas in several stages. The wash oil is regenerated by stripping out the naphthalene from the wash oil using steam in a still. In some plants, naphthalene removal is integrated with the similar process of light oil removal. The naphthalene is often recovered as a heavier oil stream which is then mixed with the tar produced in the by-product plant. Light oil – It is a general term for a mixture of similar chemicals consisting mainly of benzene, toluene and xylene (BTX). It is also known as Benzol oil. The removal of light oil from coke oven gas uses wash oil in a similar process to that described for naphthalene removal. The light oil is stripped from the wash oil in a still and is then condensed to form crude light oil. This oil can be either sold for further refining offsite or it can be refined in the by-product plant using several distillation steps in the light oil plant. The light oil can actually be left in the coke oven gas, where it increases the calorific value. There are several different processes for removal of hydrogen sulfide from coke oven gas. The specific process determines where in the gas train it is installed. The main desulfurization processes in use are vacuum process, ammonia process, wash process, sulfiban process, and claus process.